IN THE LATE SUMMER OF 1863, Benjamin and Daniel Densmore stood amidst a brimming pool of surplus labor: freed slaves from recently captured Rebel territory. Benjamin was stationed among black troops and their families in Kentucky. Daniel worked at Union headquarters of the Bureau of Colored Troops in St. Louis. Somehow, they fixed on a scheme to send "contrabands" back to their home town of Red Wing as domestic servants. Ben Densmore wrote to his father about finding "a pair of Africans" for the Hastings family of Red Wing. The Smith family also wanted a "contraband." Benjamin and Daniel kept a lookout for likely candidates. 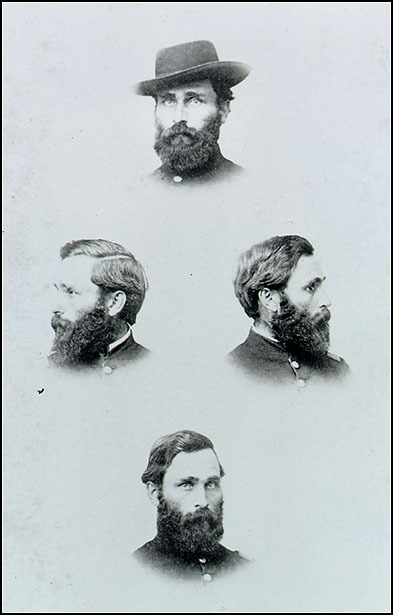 Benjamin's work recruiting freed blacks into the Third Regiment U.S. Colored Heavy Artillery offered an excellent vantage point. The Densmores debated whether to find help for their own households. Ben was gloomy. In March, 1864, Orrin Densmore Sr. wrote to Daniel that Mr. Hastings still wanted a couple - a man for the barn and his wife for the kitchen. In addition to Mrs. Smith, a "Mrs. Dr. Jones" would also take "a woman if good." They all wanted to know about wages and transportation costs. Orrin warned the boys that their mother, Elizabeth, was doubtful. We talked the "Shady question" over and the fear of getting an unsuitable or unsuited customer on our hands induced your mother to think unfavorably of the project. Since which conversation with others induces a disposition to try one if you can find one you think suitable - a single woman, tidy and honest, accustomed to house work. One of the sisters, Martha Densmore, liked the idea. Martha wrote that the family was so busy helping feed Union troops that passed through town, they desperately needed domestic support. Martha hoped for a "darkey woman" who was "neat, honest and active." She urged her brothers to hurry. Daniel was tied to his desk in St. Louis. He asked white officers commanding troops in the field to help him. The first recruiting mission failed. The need at home grew worse. The worried Swede quit in July, 1864. She could make more money at fieldwork than scrubbing floors. Then, on the night of Tuesday, August 16, Mary Prist arrived. Benjamin and Daniel Densmore served in the Union army for two more years. It's unclear how many more black domestics they recruited for the households of Red Wing. Probably not many. Nor is it entirely clear how long Mary Prist worked and lived in Orrin Densmore's home. At the time she arrived, Mary was one of about 300 blacks in Minnesota. The census of 1865 shows a "colored" woman named Mary McElroy living in the household. Perhaps, like former slaves across America, she shed a master's name for one of her own choosing. Perhaps she married. 1. Ben Densmore to Orrin Densmore Sr., 22 September 1863. Benjamin Densmore papers, Minnesota Historical Society. 2. BD to DD, 26 September 1863. 3. OD to DD, 24 March 1864. 4. DD to BD, 3 April 1864. 5. OD to DD, 28 April 1864. 7. OD to DD, 21 August 1864. Densmore's handwriting is obscure, but Prist appears to be the woman's last name. 8. OD to DD, 29 August 1864. 9. Taylor, David. They Chose Minnesota (St. Paul: Minnesota Historical Society, 1981) 74; Litwack, Leon, Been in the Storm So Long, (New York: Vintage, 1979) 247-251; Minnesota Census of 1865 (Millwood, NY: KTO Microform).